The satisfying 'ker-chunk' of the Stampede's AEG bolt system has an enduring appeal even now, more than 7 years after it first hit the shelves. Our V2 upgrade kit has been steadily popular but the time has come to implement some bug fixes and make it even easier to install. The key difference with the V3 is that it used a bare bones copper PCB to mount the through hole components to. No longer will you need to solder bare wires to the bottom of the relay. Instead, fit the relay to the board and solder the pads directly to connect everything up. The wires are replaced by the copper traces in the laminate. You can also fit the MOSFET and the resistor the same way to keep things nice and tidy. The the entire assembly can then be bolted to the rear bulkhead using a 3D printed piece, a M3x10 bolt and locking nut. We retain the stock mechanism switch in order to protect the cycling system from over run and general bugs. 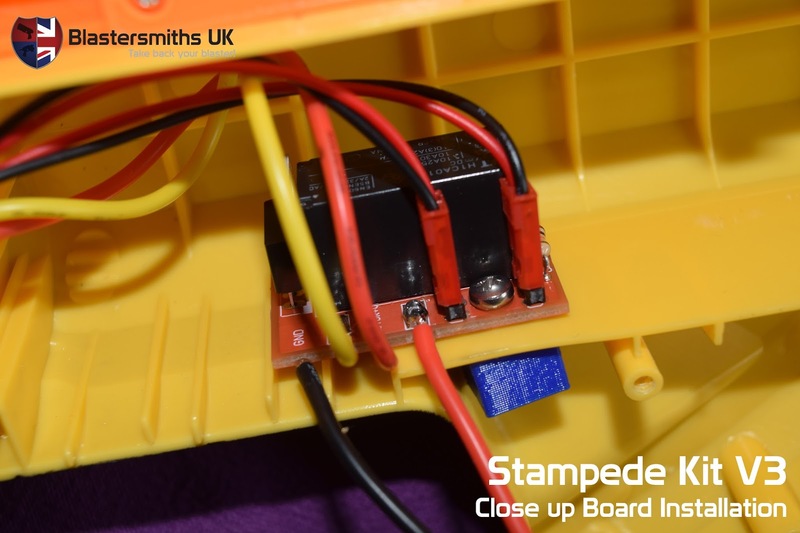 The stock loom can be wired to a JST line and then plugged directly into the board using the V3 kit. We provide two header pins for the stock mechanism switch and the blaster's on/off switch to be plugged in. 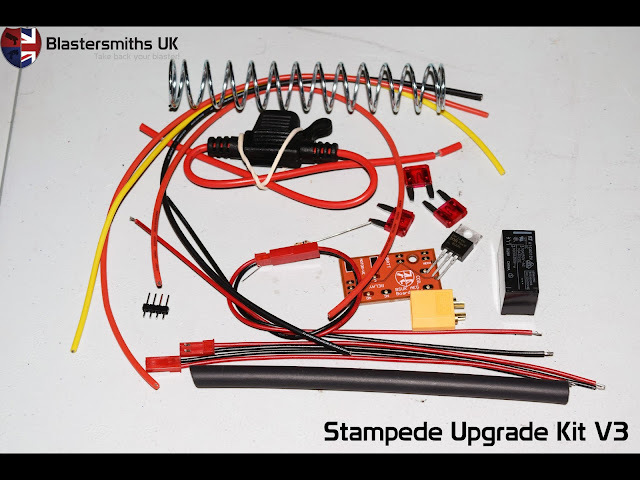 The complete kits includes all the wiring lengths you need, all the JST plugs to solder to the stock loom, heat shrink tubing, fuses and fuse holder, all the through hole components (relay, FET, resistor, header blocks), the PCB, a battery connector of choice and of course our standard 6kg Stampede upgrade spring. The entire V3 kit is available for £18 (correct at the time of writing) via our website. Dispatch time is subject to our lead times policy. Updated Wiring Kits: More Choice, More Firepower! 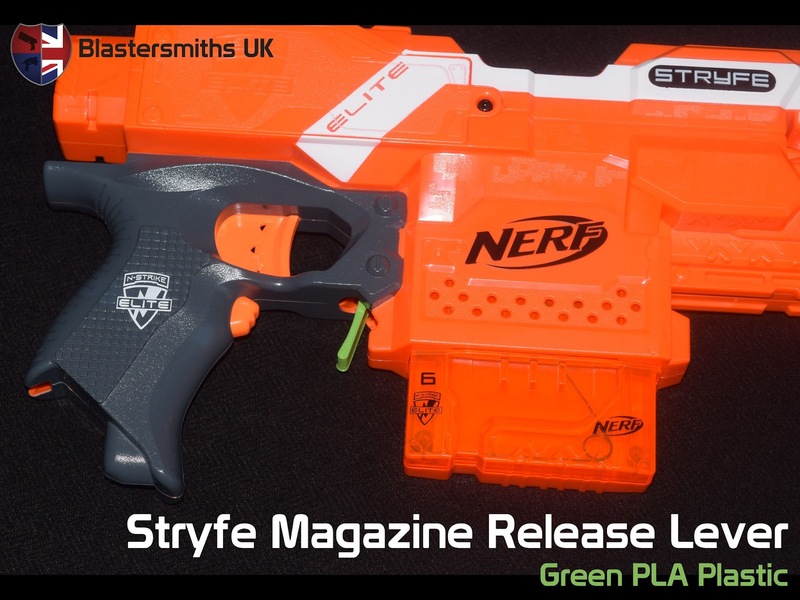 We're always looking to expand the range of our kits for various blasters and as such we've revamped our wiring kit offerings. Now that we're stocking MTB Hellcat 180 motors, some of our older looms need a bit of a shake up to be able to hand the insane levels of current that these motors demand. To that end, we've created several new lines and consolidated a bunch of products. We've merged all our semi-automatic blaster wiring looms into 2 listings: SA Standard Power and SA High Power MOSFET wiring kits. We've taken the decision to offer MOSFET kits in all cases (well, except one) for the sake of simplicity in installation. While a micro switch offers a marginally simpler circuit, a micro switch install requires a good deal of grinding and gluing to get to fit. Generally speaking, wiring in a MOSFET that uses the stock trigger to switch handle high current loads is faster to install than a micro switch and presents with far less cleaning up. Plus it has the benefit of removing high current switching gear from the trigger group (in most cases). We have our universal wiring diagram for semi-auto blasters, just swap in the appropriate lengths of wire and the right MOSFET for your motor combination (supplied with the appropriate kit) and you're good to go. In addition, we've created the new High Power Rapidstrike wiring kit that contains a heavy duty MOSFET to lift the amount of current demanded by a Hellcat 180 flywheel motor with Honey Badger 130 pusher. More details below. These are designed for your stock, MTB Rhino and MTB Honey Badger motors on LiPos that don't have too much in the way of current demand and have been proven over the last year or so to be resilient and effective. 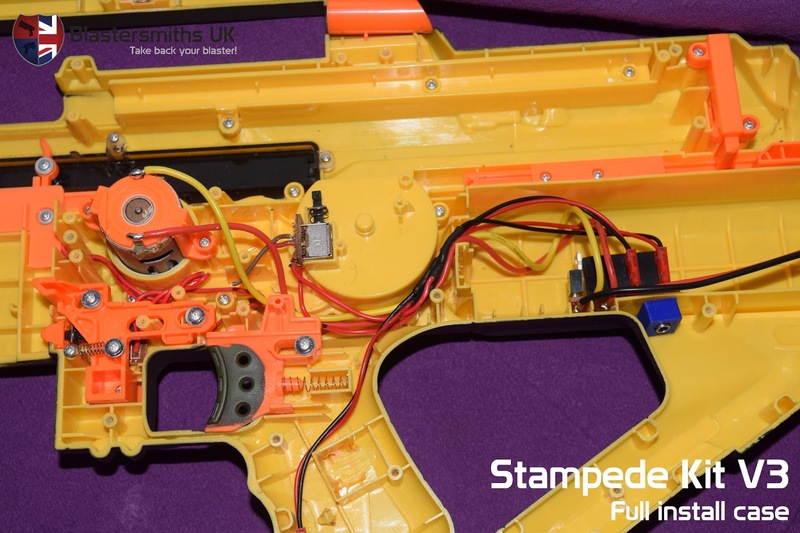 This category contains our Stryfe, Demolisher and other semi-automatic blaster wiring kits that you might have become familiar. They use 49A rated MOSFETs and 18AWG silicone coated wire. For the first time, we've also added a Rayven wiring kit and are currently adding new kits for blasters like the Desolator. The Fearless Fire and Doomlands Incisor are also on the way. Our standard Rapidstrike switch kit and the Rapidstrike wiring and switch upgrade kits both fall into this category and remain unchanged. MTB Hellcats are primarily responsible for this one because they draw 22A at stall, more per motor than a pair of Rhinos combined. For these, a higher powered wiring kit more akin to the Rival Zeus wiring loom is needed so we've added a 130A rated MOSFET and 16AWG wire in order to minimise resistance in the circuit and to get the best out of your blaster. For the first time we're also in a position to offer a high powered Rapidstrike kit in order to meet the need for the insane combination that is a 3S MTB Hellcat/Honey Badger flywheel/pusher set up. The stall current for this rig comes in at ~65A and so a beefy 130A MOSFET coupled with 16AWG wire gives you the best possible current carrying capacity and in turn response time and muzzle velocity at higher rates of fire. We have chosen to retain the Stryfe Micro Switch kit as a mechanical option for stock motors on 3x IMRs and a dummy cell. 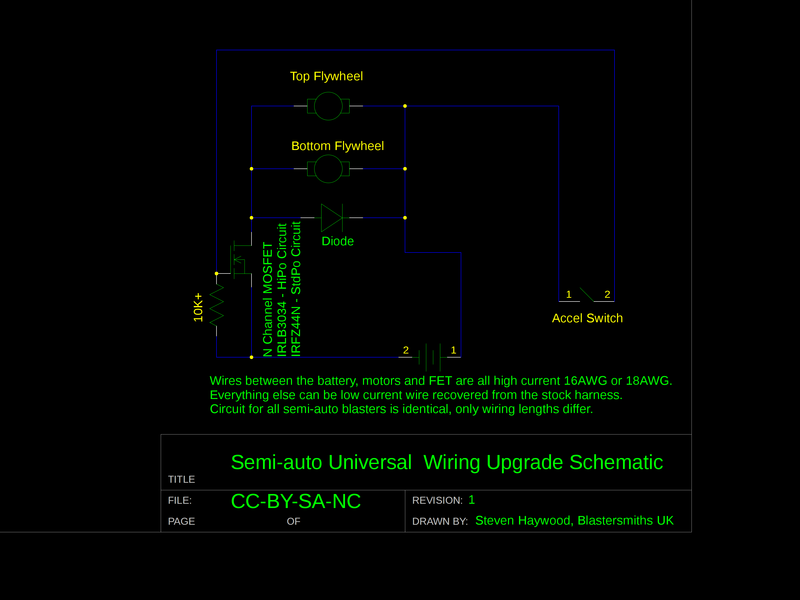 For the novice modder, a simple switch circuit can be a good entry route into the world of electrical modding without the hassle of LiPo. It won't give you the best blaster in the world but it's a good start. 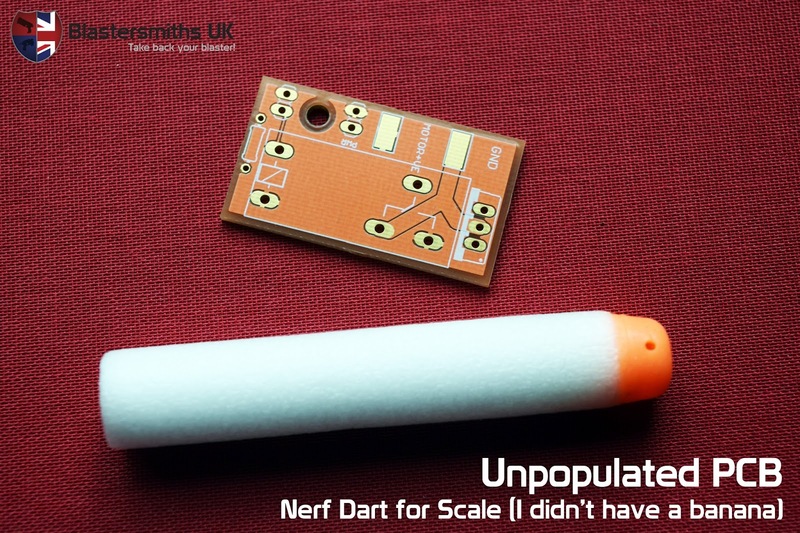 This kit can handle LiPos but isn't guaranteed to, the switches have been known to melt after extended use. So there you have it, a bunch of new products and simplified listings. The march of technology for flywheel blasters is ongoing. MTB Hellcats can average 130FPS in a Stryfe with just stock flywheels and cages, something that was unthinkable a year ago. By supplying these kits, we hope to get as many players running cutting edge, competitive blasters at their games. If you've got any questions or need a hand, the folks over at BritNerf are always great for a chat and generally useful. If you've got a specific order enquiry then please don't hesitate to get in touch. Release levers for the Stryfe have been around a while now and a number of different places offer them as a quick printed option. This Green Cloaks season, however, I've seen 2 of them snap and more than a dozen times I've seen accidental magazine drops because the lever is too long. To that end, I took on a client's request to produce a lever that balanced security with ergonomics. We tested it extensively during the last event of the year and I'm happy to say here it is. It's small and mighty, doing the job. 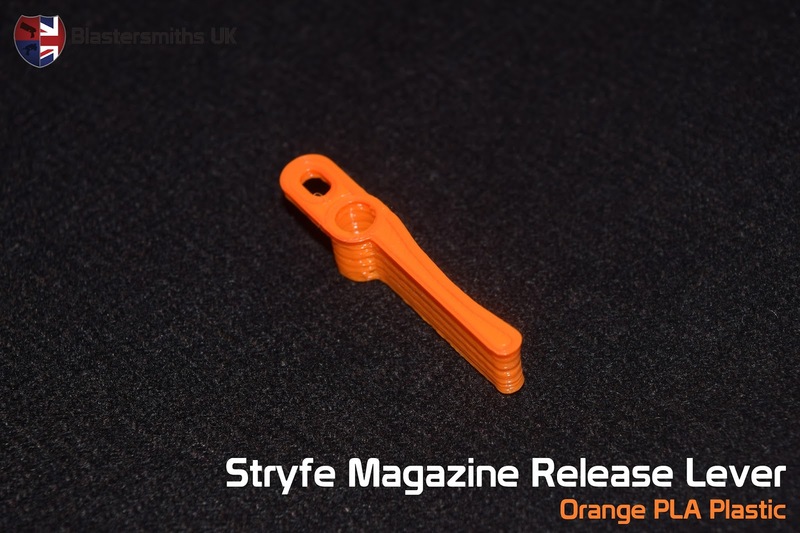 It's rock solid but adds enough length over the stock button version that you can get your mag out of there without the problems associated with a longer lever. These new levers are also available in our full palette of filament colours ranging from grey to white with two shades of blue and green in there among others. Versions for other blasters are in the pipeline, too. I'm currently looking at the Rapidstrike, Demolisher and Modulus. Once I get my hands on a Desolator that'll join the list, too. 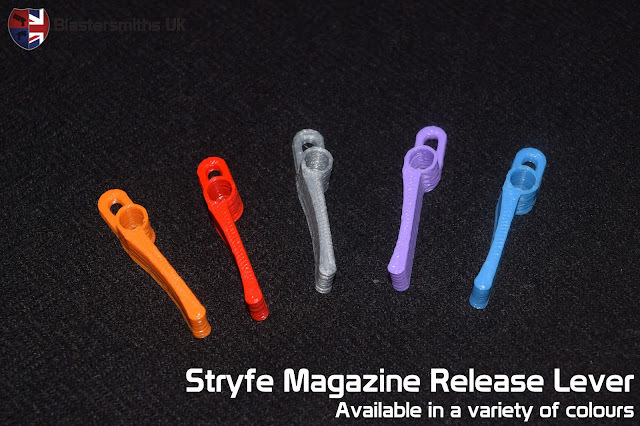 Stryfe Magazine release levers are available for £3.50 per unit from our website from 29th August 2016. This has to be have been one of the weirdest decisions of my business career but here it goes: Blastersmiths UK cannot offer black 3D printed products until further notice. If you've paid for black parts and have them outstanding, you'll likely get an email shortly offering you a refund or choice of other colours. Why is this cropping up now? Well, story time. The closure was triggered by contaminated black filament bricking our entire suite. We literally lost entire printers to a gunky mass of dust and otherwise contaminated PLA. It did all sorts of numbers on our hardware. We had to strip down, clear, rebuild and reconfigure large chunks of it to get ourselves operational again. Those printers would literally not print because of damaged parts caused by contaminated filament. We've done that over the last 2 or 3 weeks. The printers had been functioning solidly for 24 hours before we made yesterday's announcement across a range of colours. The premium black we were using was flowing fine and all was good. Then after a fixed number of printer hours, our hot ends started refusing to print black - of any brand or quality. We were able to reproduce the bug and we can confirm that our hot ends will not feed black filament past 2 hours of printer time, irrespective of contamination. They will clog, we clear them out and swap to another colour and everything prints fine. We can even switch back to black each time and get another 2 hours. The window between the start of printing in black and the first failure was ~24 hours but now we're down to a reproducible window of roughly 2 hours. Sadly rotating through colours is not sustainable as the failure often occurs mid print resulting in lots of wasted time and filament. We have no idea why this bug has cropped up now when we've printed dozens of kilos of black filament in the past year. We are in touch with our hot end manufacturers and both filament suppliers to see what's what. The bug is sensitive to the quality of filament, too: the premium grade stuff we're using as a stop gap has a better half-life than the last of the known good bulk stuff but the bug is still there. The weirdest part is every other colour we can print does that - it prints! To that end, we can only offer non-black parts until we resolve this. On the bright side, I've got some silver and brass filaments I'm going to be adding to the options to widen the array of colours available. I'll be looking to add more in the coming days. We're back! After 2 and a half weeks of herculean effort from our team, we're back with our full range of products with the printers ready to work flat out to fill orders. We're still clearing a bit of a back log and we're still a couple of printers down but we've got things in hand. The frames that are offline are due to come on stream in the next week and the ones that are running have more capacity than when we closed. We are currently using emergency stop gap filament to print black but it's literally the best stuff you can buy so there aren't any concerns there. It will print until judgement day and is just lovely. We'd use it normally were it not for the obscene cost. Orange and dark blue remain unchanged and we've been able to build up a bit of stock of products in those colours while the entire suite now begins to catch up with black parts orders. What's next? Well, as I said, we've got a couple more printers to bring back on stream in the next week. The parts for those will be here Wednesday so I'm expecting full operational capability by next weekend. That'll give me 80% of the printers (and capacity) I need to cut the lead time from 4 weeks to 2 weeks. From there, we've just bought a new configuration of extruder drive that will allow us to print using direct drive rather than using our current Bowden tubes. That will let us print faster, with more precision and less post processing to remove over-extrusion dribbles and strings. Once installed on our current frames, it should provide us the last 20% of capacity that we can use to drop the lead time permanently to 2 weeks. The best part is that it's built for exciting new materials like NinjaFlex and other flexible 3D printing filaments so we can really start to expand our capabilities in the next year or so. From there, it'll be a case of simply adding more frames to add to our capacity. We're pretty happy with the home-brew system we use and it's built to scale up perfectly to as many printers as we need. It's been a long few months and I'm reasonably confident our bulk supplier has changed things up their end sufficiently to prevent a repeat of this mess. The breathing space this closure has given us has allowed for some serious upgrade planning in the next few months. With the new drives and a few other bits and pieces that we're working to bring to the suite, we're coming out of this in better shape than we came in. Thank you again to everyone for their support over the last few months, it's very much appreciated. In an effort to keep everyone up to date as much as possible, here's another update. First the bad news: we received a shipment of filament from our supplier late last week. Upon inspection of the batch numbers, it was from the same contaminated batch that bricked the suite the first time out. Needless to say, we were exceptionally cautious about feeding it through our hot ends and so have left it in the boxes. Efforts to contact the supplier were slightly hampered by Green Cloaks E1 at the weekend. However, I've received an email in the last hour from our guy over at the filament manufacturer apologising and promising to get us a new, non-contaminated batch sent today. That means our bulk black should be here Monday. In the mean time, I've got a UK supplier I'm going to call to see if I can get some filament from them posted to us for tomorrow. That way, I can get black printing before the weekend and the re-opening of the service. Otherwise, we are printing happily in every colour that's not black. And then there's the good news: we've been adding capacity as we go during the closure; tweaking bits and pieces. We've made some modifications and tweaks to our existing printers to vastly improve their foot print and with good quality filament, we'll be able to increase their speed too. That means even more capacity than we were expecting before the extra frames come online. Thank you again to everyone for your support during this difficult run. We've been working hard to make best use of the time given to us by this closure. When we open again, we should have enough capacity to start development again and bring you shiny new things. I just thought I'd post a quick update on how things are progressing at this end with regards to our printer services. We've managed to restore 50% of capacity at this stage and it's remaining stable. We're currently awaiting parts for the other 50% and that should come back on stream week beginning 25th April. In short, in terms of capacity we're on track to re-open on 1st May as previously predicted. I'm also going to return the Rapidstrike wiring kits to the site since we've got our main printer for those back and can produce those very, very quickly. Given that colour for those doesn't matter, they're the first thing to return to the website. We are, however, still stuck in terms of black filament. It was black that knocked us off line in the first place. We're down to our last half kilo of known good filament and our reserve supplier can't supply enough to feed the beast as it were. Our original supplier is still over-hauling their machinery and processes to prevent a repeat of this episode. That will take sometime, apparently. I've got kilo after kilo of orange and blue filament ready to go so if I contact you with regards to your order, you will very likely get an offer to change over to another colour free of charge. Of course, a full refund is still on offer if your order is delayed and hasn't been posted or we can delay your order until the black filament situation is resolved. So yeah, that's how things are at this end. Thank you everyone for your messages of support. It means a lot to know we have such a great community behind us that'll stick by us even in the tough times. In return, we'll do everything we can to keep the communication channels open and keep people in the loop.